The History of Erik's Washburn N4 "Leadbelly"
Erik purchased this guitar in September 2000. It is a very unique instrument that was built in 1993 as an experimental model for Nuno Bettencourt. It actually spent the first 7 years of it's life owned by Nuno himself. In April of 2000, during his Mourning Widows tour, Nuno sold several of his intruments. Several months later, Erik was in the right place, at the right time, and was able to aquire this guitar. The guitar itself plays exceptionally well, and has a dark tone with tons of sustain, yet at the same time(via the Bill Lawrence L-500 pickup), can really cut through the mix. An amazing super strat, this guitar found it's way on to many of Erik's recordings. Erik keeps this guitar in pristine condition in his studio, even tuning to E flat and using Nuno Bettencourt signature Dean Markley 10-52 strings. So is this really Nuno's Guitar? Since the creation of Erik Z Music.com, I’ve received countless hits from assorted Washburn, Nuno amd N4 guitar forums around the world about this guitar. I've seriously had to use Google Translate to figure out what's being talked about on the internet about me and my N4. :-) So, I decided to expand this section with a bit more info and pics to help the provenance. As you can see, the seller circled the Korina one, but if you look above it you can clearly see my N4 and serial number. (why would someone on ebay selling a Korina N4 randomly have the SN# and description to my guitar?) Also, please note this is the seller receipt and shows that Nuno himself was the one who sold the guitar. When I purchased my N4 leadbelly the sales manager, whom I was friends with, let me take a look into Guitar Center’s computer to show it really was his guitar. I saw the same info without anything blacked out. This is a picture of the Korina N4 from a French Guitar Forum. I can only assume this the person who ended up buying it, or is the seller from ebay. This pic is a couple years old, and I apologize to the poster as it’s being used without permission, but at the same time it does help prove the lineage. Note the signature and date match my N4 Leadbelly exactly. Korina N4. 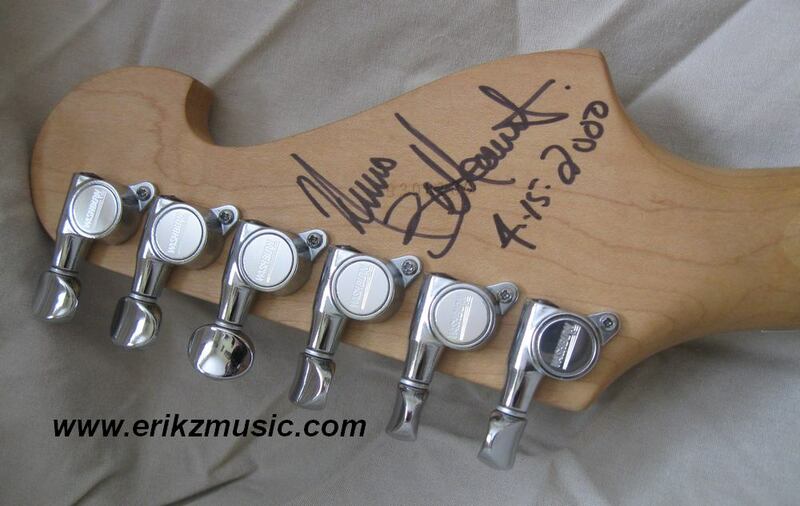 One of four guitars sold by Nuno Bettencourt in April 2000. There has been some speculation as to whether this guitar was once called the Washburn N5. Obviously there’s now a N5 model that Washburn sells with single coils, but long ago there was a rumored N5 experiential model and the Black leadbelly was believed to be it. I’ve heard speculation from the Washburn forum that the original N5 had a split Floyd Rose that allowed you to change the pitch of only half the strings, but this was pure speculation. It may have been changed prior to the sale, but all I know is that if this is one the original N5's, it only has a stock Washburn Floyd Rose. The former drummer of my band Aesthetik actually met Nuno after one of his Mourning Widows shows back in 2001-2002 and asked him if he remembered the N5, but Nuno didn’t seem to recall the guitar. 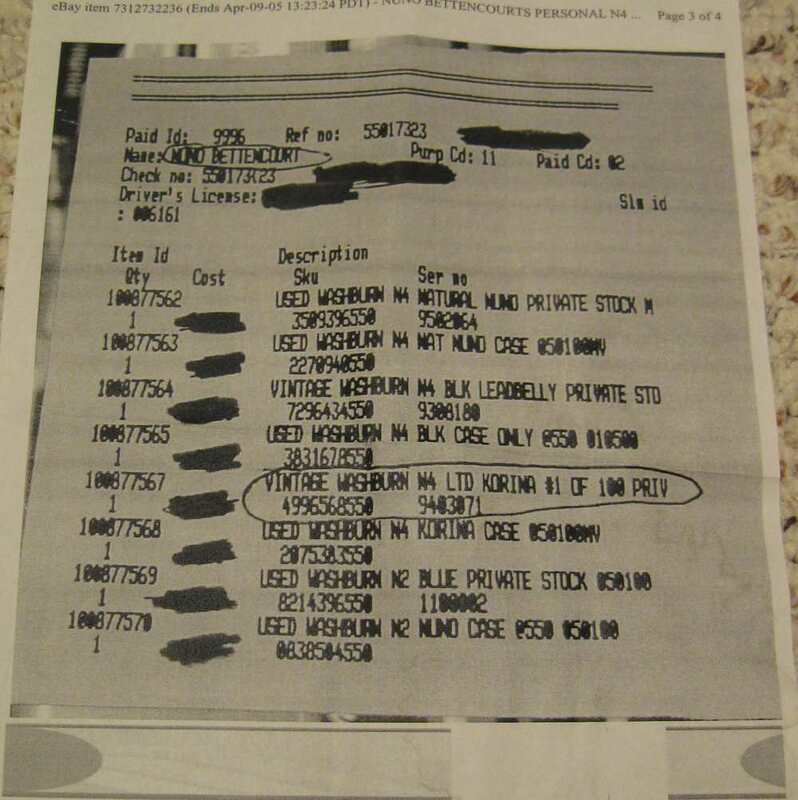 The following is a picture that surfaced in the Washburn forum's after I'd updated my site. It's of the actual "N5" from Nuno's guitar collection. As you can see it's black and has an N5 sticker. Also note the Stephen's Extended cutaway is not alignned properly to the body, as well as this guitar has the Floyd Rose nut attached through the neck as opposed to into the neck on mine. Again, the picture is used without permission. Just trying to help solve a mystery. Here’s a picture of Nuno from way back in the day. I have absolutely no proof that this is the same guitar, and I again apologize since I don’t own the rights to this pic, however if you do some searching for all of Nuno’s guitars over the years you’ll note he’s never been pictured with another glossy black, unstickered, N4. So... this could very well be my N4. Who knows. Video of the Washburn N4 "Leadbelly"
Although you don't actually see the guitar, this is one of the few videos I have on Youtube of actually playing the Washburn N4 Leadbelly. In this video it is tuned to E flat and strung with the Dean Markley 10-52 Nuno Bettencourt Signature strings. (Just like Nuno uses) Although there's a healthy dose of sarcasm in this video, and it's more of a pedal video, you can really hear how great the Washburn N4 leadbelly sounds, especially with the Analogman King of Tone and PaulCaudio Timmy stacked. That’s it for right now. If anyone has any more info about this guitar, please drop me a line at Erik@erikzmusic.com. I’d really appreciate any info that helps corroborate the story. Songs that feature the Erik playing his Washburn N4 "Leadbelly"
Three and a Half Years gone..